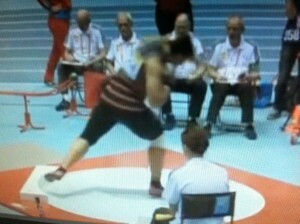 I understand the European model of developing hammer throwers. Starting kids at eight years old like they do in the hammer throwing countries is beyond a doubt a proven way of developing the hammer. Unfortunately, even though there are pockets of places training young kids to throw the hammer in this country and that is a big bonus to the event in the USA, it simply doesn’t reach enough talents kids. As much as the former Soviet system was admired for the techniques they developed, their real secret to their success was the 1000’s of talented people, many talented coaches and all the training and hammer data they had collected during that process that pertained to hammer development, specific strength training and special exercises that developed and produced those medal stand guys. We need a system much like we have now for the shot and discus in the high schools, but this will never happen in our Politically Correct school systems. There is just too much liability, too many lawyers, and too much money to build the cages and fields for many school districts. The NCAA system, then, is our minor league for this event. The best talent ends up in the NCAA system in the throws and it is up to the college coaches to identify good shot and discus guys who might end up being better hammer throwers. The problem with this event is we won’t be successful taking the European 10-15 year approach. Our kids have to be throwing 70m-75m coming out of college to have a chance to continue. 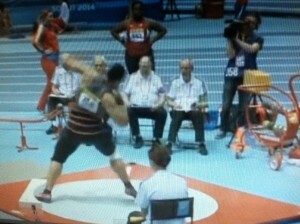 Hammer is great cross training for the discus and the rotational shot and benefits both those events. The more guys we can expose to this event in college the better chance we have of finding a guy with 80m talent. Lance is a good example of this. Excellent discus thrower, good shot putter and world class hammer thrower after he left college. We do not have the time to start a thrower on a light implement and throw it 75-80m and then the next year hand him a slightly bigger implement and take the year to match the distance from the year before. Also, throwing a light ball far at the young ages is no guarantee that the same athlete will throw the international weight far. 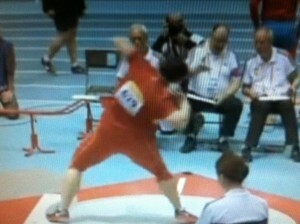 Europe is full of athletes that throw fantastic at young ages that never make it with the bigger implements. From what I see we need to train this event 65/70% Overweight, and 65-70% Speed during the college years to accelerant the progress of the event. Some aspects of the event will be neglected, but we don’t have a choice the way our system is set up. Much has been written and discussed about the Bondarchuk Methods of training the hammer. His system is awesome and all based on competition length hammers that are heavy down to light. The heavy hammers are the main work of the system and the light lifting is used as the stimulus to drive the heavy hammer work. This stuff works without a doubt but takes many years to build and especially for the masses. Now back to the 65/70% Overweight, 65/70% speed. In order to make up for the years of concentrating on making light implements go far, the hammer has a unique aspect to it by allowing coaches to change wire lengths to affect speed. This allows a heavy implement to become a speed implement at the same time. Hammer training with the use of different length implements can be tweaked to find recipes that will build the specific strength and the speed at the same time by using weights, ½ wire, ¾ wire, or whatever lengths you can put in your hammer training toolbox. Even extra-long implements have a place in the training for addressing certain problems. I have athletes that thrive off of short wires as the main tool of their training, some that thrive off of weights and long hammers, some that thrive off of extra-long hammers and ½ wires etc…Every thrower has what I call their implement recipe to get the desired results. We make the hammer too difficult in this country. This event is all about time and reps. It takes years to build distance with normal length hammers for training. This event is all about ten feet per pound. If you can throw an 18lb 60m and your 14lb is 72m then your 16lb will be around 66m. The light implement is just as important as the heavy to the total outcome of the competition implement. This is simply what the Soviets were doing. Yuri threw the 10k 70m, the 5k 100M (according to Bondarchuk’s book) and the middle ground of that is 85m. If the athlete is a good technician and has speed he will exceed that number by 1- 2 per cent and if he is not he will be down by 1-2 per cent. This is the game of hammer throwing. Finding the recipe to make light and heavy implements go far. If you throw a lot of light only you will get stuck, and if you throw heavy only you will get stuck. In hammer training I have seen time and time again that the heavy ball moves first, then the light ball will move second and then the middle will move. Sometimes the heavy will go far and the light will go far and you won’t see the middle move for 9-12 months and then boom! a 5m jump with the competition weight. Hammer progress is being made as long as something in the throwing is getting better. However, the lifting to hold up to this type of training has to be more intense and certain hammer workouts have to be put on certain days to maintain progress. There are hammer workouts that go very well the day a heavy lift, two days after a heavy lift, and three days after heavy lift and this is all due to how the CNS is recovering and muscular system of the body is recovering. They both recover at different rates. Now, to end this paper I would like to say that we hurt ourselves also. The hammer is an event where recruiting foreign throwers is a great advantage. A guy entering college with ten years of hammer experience is no match for the junior with three years of experience. The money spent on these guys does little to develop the event in this country. I have heard for 30 years now how having foreign hammer throwers will help American hammer throwing, but the numbers are not there to support this. What it really does is just limit the pool of USA athletes that can receive support for the event. Every NCAA coach in this country is needed to develop this event so we can find that guy with the 80m talent. In the last two years, I have been conducting a personal case study involving the glide and rotational techniques performed in shot putting. In this personal study, I took a glider with six years of experience who had thrown 17.23m with the technique, and started working a glide/spin combo throwing protocol for all implements for entire practices. My findings, after thousands of throws, showed that using the spin technique averaged 11-11.5% better than the glides taken during the practice sessions. This led me to strongly believe that women shot putters could once again approach the distances achieved by men in the event. The women of this country will simply have to make the same transition the men did roughly twenty years ago. In the early days, the spin technique emerged when gliders began experimenting with new methods of throwing the shot put. At first, the distance between the two techniques wasn’t great. The majority of throws taken with the spin were the same or no more than two feet farther than the glide. Yet, as testing became stronger, throwers became weaker and more guys started playing with the spin. The result of the experimenting with the new technique was that the distance between the two systems started to expand. At some point, rumors of guys putting ten feet on top of their standing throw started to surface, which was very hard to believe at the time. Then the next generation of rotational throwers started talking about their full throw as being 12-14 feet further than their standing throws, and ten feet on a standing throw became an accepted number. This is significant because the glide in the past required certain qualities to throw 70-73 feet. It mainly demanded a large standing throw because a glider could typically only add 4 to 7 feet on top of their standing throw, which required a 72-foot glider to have at least a 65-to-68 foot standing throw to attain that distance. Although making a standing throw that great seems hard to believe in this day and age, 65-to-68 foot standing throws were commonplace at the world class level during the 80’s and early 90’s. 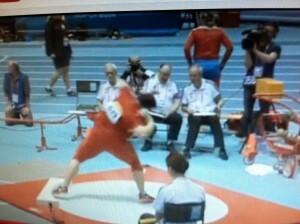 I have not seen an American 65+ standing throw in 20 years. The influence of steriods on this era were made clear in a report compiled in the former East Germany. Under a state-supported drug regimen, the average male thrower was expected to improve in a four-year time period 2.5m-4m in the shot, 10m-12m in the disc and 6- 10m in the hammer. The women were expected to improve in four years 4.5m -5m in the shot, 11-20m in the disc, and 8 – 15m in the javelin. These are the former DDR numbers whose state-supported system developed and tracked these increases. Therefore, men who threw 62-to-65 foot throws clean could make the jump to 70-73 feet with the glide and become world class throwers within weeks. However, during the 1990’s when testing became better, the big standing throws went away and so did the big gliders in America. This is what happened, and the USA–maybe unknowingly– made the adjustment to the spin. Due to the big standing throws falling about 2-2.5m from what they used to be, the men in this country turned to the rotational method to make up the distance lost. Because of that change, American men broke the 22m-barrier clean, which many people still refused to believe. In my estimation, there have been six men to throw over 22m clean in this country with the rotational method. It is safe to say that after the rotational technique evolved in this country, the glide is not what is used to be, even on a world level. All one has to do is look at the amount of world class gliders from the 80’s and early 90’s compared to today. The male 70-foot glider is definitely an endangered species–much like a high jumper still using the western roll was when the flop took over. Many say this is a different deal with the women, but I say it has not been explored fully enough. The women throw a 4k, so the body weight to implement ratio is much different from the men. However, the standing throw to full throw differential is about the same. Just like the men, 115% on standing throw is considered great gliding. Still, the clean 70-foot throw for women most likely has not been done yet. World class gliding for women takes one of two great physical qualities. These characteristics involve a very big, tall, athletic woman (6’3″ to 6’6″ and 220 to 300lbs) or a girl with a golden arm very much like the skinny kid that throws the 95mph fastball. I have seen a couple of golden arms in Terri Cantwell and Michelle Carter in this country. Both these women could stand 59-61 feet without world class strength levels, but these athletes are very rare. The only women we should consider for the glide shot technique are these two types of women. If you do not have a big standing throw, you will have a hard time reaching world class female levels in the shot. Now, the question is what do we do with all the women that don’t have huge standing throws or huge levers and mass? Make spinners out of them. Jill Camarena made the change from a 59-foot glider to a 66-foot spinner. Jill was the one thrower that made me take a very serious look into women with rotational technique. All it will take is 1000’s of girls working at it from a young age, and it will happen. If guys can go 12-15 feet on standing throw, there is no valid reason why women can’t do this also. It’s just going to take one girl to break through like the men did years ago. The first step to this process is getting high school girls throwing a 3k shot to develop the CNS pathways to throw a shot far. Training for the 3k would require work with a 2k, which would also further teach our girls how to throw something far. So when the young girls are ready step up to the 4k, it’s just a matter of building physical and specific strength through lifting and throwing heavy implements before they are able to match the collegiate men. We need high school girls throwing 20m with the 3k. The more girls that can accomplish this, the more likely we will produce better marks at the next level. The main concern with the execution of this theory would be establishing a throwing system that teaches high school coaches how to coach and teach the rotational method before the girls reach the college ranks. Then the cream will rise to the top and a 70-footer will emerge years later from the system. With the rotational shot technique, women should follow what the men have accomplished with the spin in the last 20 years. The glide for the men in this country has became obsolete with the explosion of male rotational throwers who reach “drug era” distances without using drugs. The same will happen for the women if the necessary steps are taken. 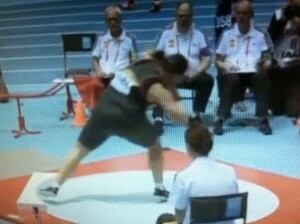 I am convinced that a 21m throw could spring out of the hands of a female spin shot putter someday in this decade. Who will be the first is an unknown at this point, but it can be done. Make no mistake about it, and as much as the Europeans like to point to one or two guys throwing far with the glide, our NCAA system produces 19m, 20m, 21m throwers like a machine. This we are doing right; however, my next article will be on what we are not doing and need to do in the disc. How to make up those 80’s and early 90’s discus differentials.